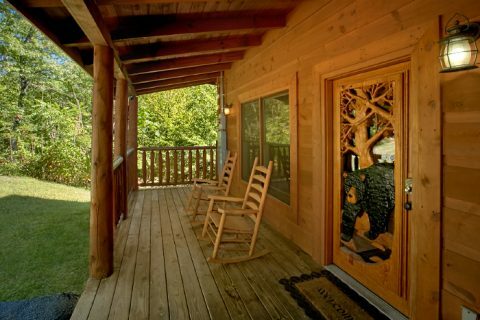 Ready for a truly luxurious cabin vacation that's only minutes away from Gatlinburg, TN? 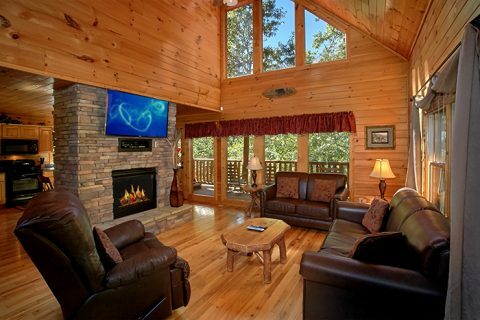 "Can't Bear To Leave" is an unforgettable, 2-bedroom luxury cabin located in Sky Harbor Resort complete with a theater room, hot tub, jacuzzi, arcade games, and more! 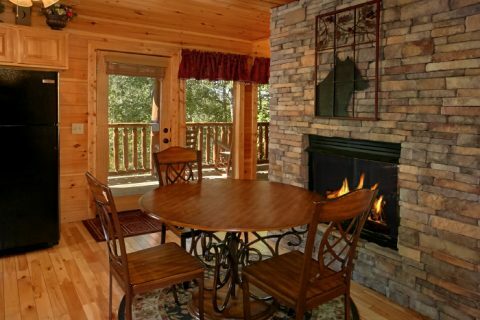 From this rental's beautiful stacked-stone fireplace to its lovely covered deck surrounded by a serene Smoky Mountain forest, there's a lot to love about this premium Gatlinburg cabin. 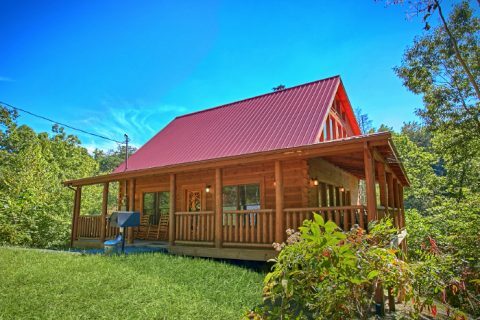 With room for up to sleeps 6 guests, this family-size cabin is a great option for a family trip or an intimate romantic getaway with someone special. Ripley's Aquarium, the Gatlinburg Space Needle, and several entrances to the Great Smoky Mountains National Park are easy to reach from this resort rental. 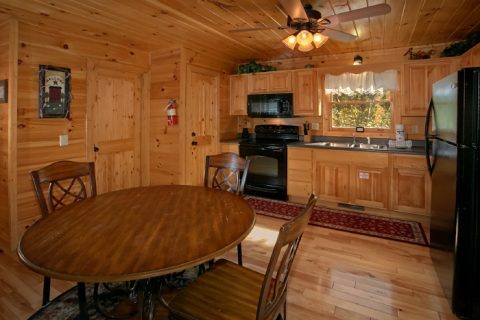 Since this cabin is located a short drive from the Spur Road that connects Gatlinburg and Pigeon Forge, all the sights and attractions of Downtown Gatlinburg are only 10 minutes away! 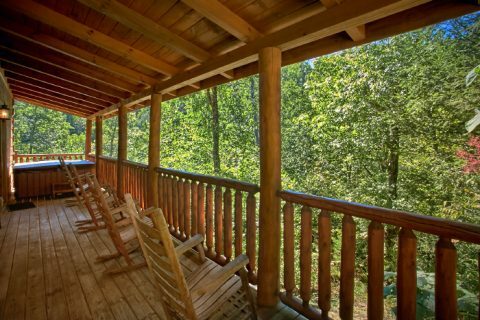 Back at your log cabin, that's close to all the action, you'll find plenty of space to unwind with the people who matter most. From the large theater room with a 64" Smart HD television, surround sound, and theater style seating to the classic arcade with 60 games and a two-person arcade game, this cabin is ideal for fun and relaxation. 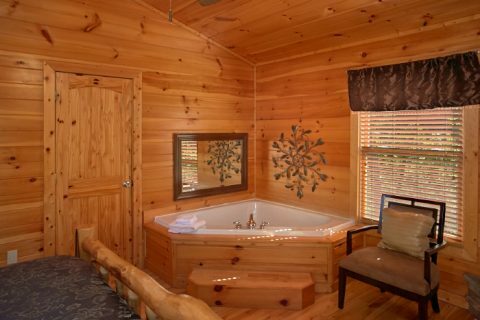 Enjoy a romantic bath in the jacuzzi tub in the master suite or listen to chirping birds on your rental's hot tub on the deck. On top of all these comfortable amenities, all televisions and the home theater come with premium digital movie channels. In the evening, fire up the gas fireplace in the living room and enjoy a quality meal made in your rental's full kitchen. 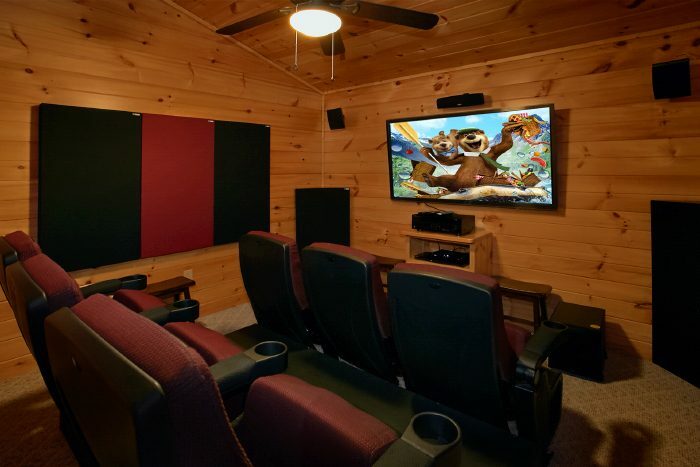 After a delicious dinner, enjoy a movie in the theater room or just take in the sights and sounds of nature from your rental's rocking chairs on the deck. 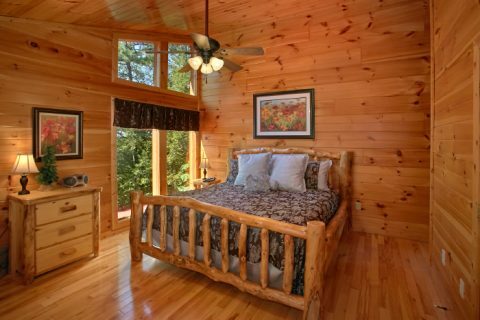 When you're ready to get some rest, retire to one of your cabin's luxurious, king-size beds. 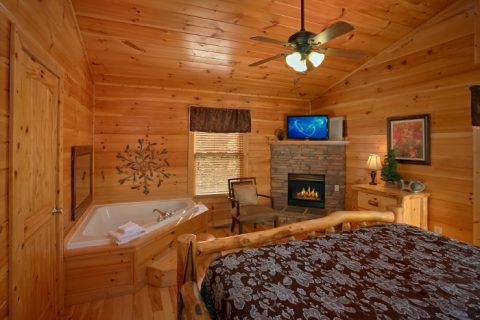 On the main level, you'll find a bedroom complete with a log bed, 32" television, DVD player, romantic fireplace, and a bathroom with a jacuzzi tub. On the top floor, a master suite boasts another king-size bed with a fireplace, an in-room jacuzzi, and television for relaxing in the evening. In the living room, there is a sofa bed for accommodating extra guests. 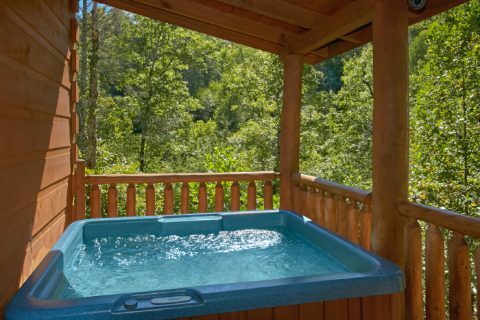 When you wake refreshed in the morning, you can drive to nearby Gatlinburg to enjoy some delicious country pancakes or easily make a quick breakfast in your rental's kitchen before you set off on your next adventure in the Great Smoky Mountains National Park! 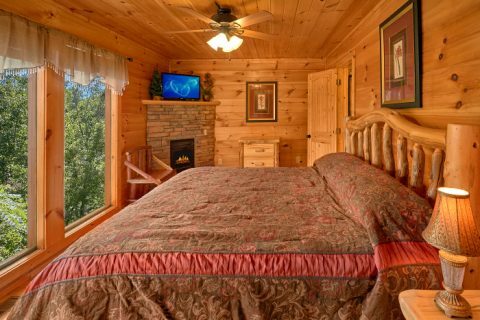 Book your luxury theater room cabin in Gatlinburg online today and save 15% on your booking! 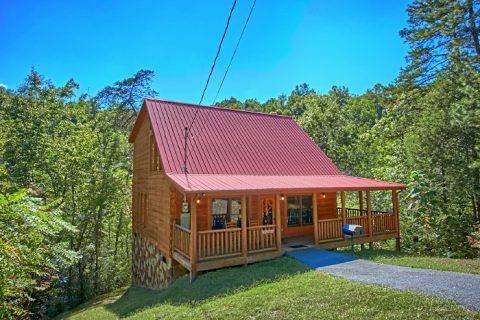 Save your vacation dollars for enjoying great local attractions by staying at this beautiful cabin with Cabins USA Gatlinburg!